A Review of the book, Mannahatta: A Natural History of New York City, by Eric. W. Sanderson. 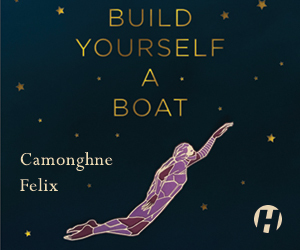 On a recent summer afternoon, I contemplated the paradox of canoeing through New York City. 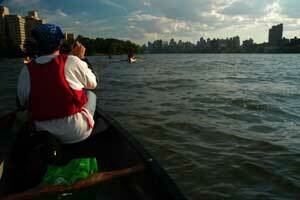 I was paddling with the downstream tide along the East River with Friends of Brook Park. After launching from an abandoned city pier in the South Bronx we headed towards a small island just south of Roosevelt Island. It is rare to find a place to touch nature in New York City, as it has ebbed and flowed throughout time with little change. Feeling the current against my paddle, I drifted into a regular daydream, one I do not dare to own: What did this landscape look like before it was conquered by steel and concrete? Eric W. Sanderson’s book, Mannahatta: A Natural History of New York City (Abrams, 2009), has created this reality. After 10 years of cartographical and ecological research and computer modeling, Sanderson’s team have reconstructed a picture of what Henry Hudson’s eyes would have seen Sept. 12, 1609, when his 85-foot long Dutch ship the Half Moon crept into the New York harbor in his expedition to find a northwestern route to Asia. 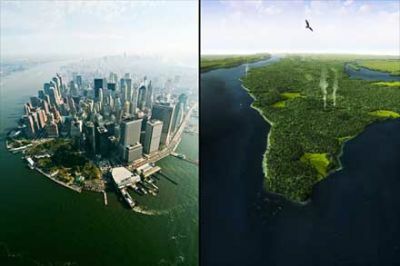 The 352-page coffee table book is a must have for the beautiful full-page color computer-generated images that depict Manhattan exploding with green forests, estuaries, blue streams, yellow meadows, dark ponds, wildlife, and well, indigenous Lenápe settlements. Also known as the Delaware, the Lenápe people had occupied the coast from Pennsylvania to New York City for 10,000 years before Europeans blew in on boats. The projected images of Mannahatta (Lenápe for “Land of Many Hills”) are often placed next to urban photographs of the same location — an in-your-face comparison that is hard to believe. Red-maple swamps stood where Times’ Square does now. The Lower East Side was a large salt marsh. Bogs filled Central Park and sandy beaches extended along the Hudson River from the Battery to 42nd Street. (See The Mannahatta Project for its interactive website.) Also included are reprints of old maps, detailed colored paintings of wildlife, and a chapter about the Lenápe people. Sanderson’s portrait of Mannahatta provides a lens to see why European explorer-capitalists would have drooled over this little island. That while his exploration did not lead to the East Indies like he had hoped, this location was surely as rich: “… skins and peltries, martins, foxes,” Hudson promptly reported to his financiers when he returned to Amsterdam. Less than a year later, Dutch private traders, including the famous Adriaen Block (which a school in Flushing, Queens, is named after), launched profit-seeking fur expeditions into the area. While Mannahatta provides us with beautiful pictures and descriptions, the book gravely lacks significant political, economic and historical information and analysis to explain the forces that transformed the island to what we recognize today. Starting with the Dutch colony New Amsterdam in 1624, the English take over in 1664 and finally the U.S. state of New York, the island experience almost a complete makeover. To make room for development, the land was stripped of its 573 hills, 66 miles of streams, 21 ponds, old-growth forests with American chestnut trees 120 feet tall and 4 feet wide, and dozens animal species — including the beaver. The Lenápe were forced out by colonization, disease and treaties that pushed them west. Just like the Dutch traders, Sanderson also opted to focus on the beaver. In order to construct the computer-generated maps, Sanderson needed to uncover Mannahatta’s original indigenous human and environmental landscape. Using the beaver as a model, Sanderson explained how one species could be used to reconstruct an entire ecological system: each animal is related to a myriad of other species and habitat elements that they require and provide. The beaver needed streams, willows, alders and aspens, and fish. In return, the beaver provided food for black bears, clothing for humans, and created meadows by flooding the forest with ponds, which become home frogs. By following these relationships of need, Sanderson was able to draw a “Muir web” that depicted the complexity of Mannahatta’s likely natural environment. From there, his team developed probability maps for vegetation, soil types and animals that made up the 55 estimated ecological systems on the island’s 20 square miles. On page 203, he presents map of the probability distribution for beavers across Manhattan. This is a map that Hudson would have loved to have, indeed. In fact, early Dutch and English maps included drawings of animals of interest, such as the beaver. And the Lenápe knew the New York City region quite well because they had helped manage the island for generations. The European traders who flocked to the region after 1609 to harvest furs heavily relied on Native American scouts and hunters. The driving economic force at the time were beaver furs, which could be felted and made into fashionable Russian and English hats. One of the adopted currencies in New Amsterdam was the beaver pelt, which American Indians would trade with the Dutch for other goods. Shorto writes that in 1626, a Dutch official noted goods arriving from New Amsterdam, including oak and hickory timber, dozens of skins from otter, mink, wildcat, rat, and some 7,246 beaver skins. Within 20 years of arriving to North America, the Dutch were already beginning to tear apart the island’s ecosystem web, which heavily relied on the beaver. The demand for beaver in the larger New England area bred conflict, inciting the Beaver Wars, the French and Indian War, and several large intra-tribal wars. As the beaver populations were extinguished in the eastern United States, slowly fur traders headed west, further into a continent already inhabited by millions of Native Americans as documented in Charles C. Mann’s book, 1491: New Revelations of the Americas Before Columbus. The Lenápe did not fare well, either. New York City historians and CUNY professors Edwin G. Burrows and Mike Wallace estimated that some 15,000 Lenápe existed in the greater New York metropolitan area in some 80 settlements at the time of European settlement in their book, Gotham: A History of New York City to 1898. The book 1491 documents the early pandemics that whipped along the New England coast after the arrival of European fishers and traders in the 1500s, killing an estimated 90 percent of the coastal native populations. The Lenápe who survived disease would witness generations of colonization, as treaty after treaty with the new “Americans” moved them further west from the coast, first into Pennsylvania, then to Ohio, Indiana, Missouri and Kansas, then finally to Oklahoma in 1866 (Another community exists in Ontario). In fact, 400 years later, Lenápe descendants now living in Oklahoma (known as the Delaware Tribe of Indians) just regained their federal tribal status July 28, 2009. Although Hudson is not solely to blame, what happened after he left New York harbor in 1609 only further incited the now 400 years of colonization, exploitation and genocide from the Atlantic to the Pacific by the Dutch, English, French, Swedish and Spanish — and ultimately by Americans themselves. This is hardly reason to celebrate on September 12. 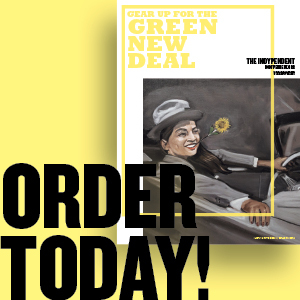 Mannahatta has certainly remained the island at the center of the world — largely because it became ground zero for the American industrial revolution and the financing of Western U.S. expansion and exploitation, and, after World War II, for global capitalism. Literally everything that existed on the Lenápe’s traditional lands was rapidly liquefied into commodities and destroyed on a massive scale. In language that is overly dumbed down for the average reader, Sanderson attempts to make this point — in a silly marketing ploy — at the end of the book when he imagines New York in the year 2409. He advocates that by instituting some changes (such as greenroofs, eliminating cars, generating renewable energy and growing food locally) New York City can be transformed into an quintessential sustainable city. In a futuristic, inflated version of Mayor Michael Bloomberg’s PlaNYC 2030, his ideas are simplistic and lack depth into understanding the real history that first shaped Manhattan, then the rest of the world. The forces that were set in motion on Mannahatta in 1609 — along with their counterpart moments in South America, the Caribbean and Central America — continue provide the mainstream thrust of how people today interact with the environment. Sanderson writes, “These images of Manhattan’s past and present stand as symbols of the great tension at the heart of twenty-first century humanity’s relationship with the natural world.” Yet, he provides no attempt to clarify. What’s the point of learning about Mannahatta’s original landscape if the reader does not understand the forces that destroyed it? Hidden in the book is one important paragraph, which should be a starting place for a real discussion on Hudson’s 400th anniversary. A shorter version of this review will be published in The Indypendent September 18. 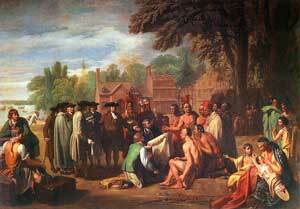 Art Credits: The Mannahatta Project; Benjamin West‘s painting (in 1771) of William Penn‘s 1682 treaty with the Lenápe.